Welcome to Sneak Peek, our weekly lookahead for both ends of Pennsylvania Avenue, plus my best scoops. I'd love your tips and feedback: jonathan@axios.com. And please urge your friends and colleagues to sign up for Sneak Peek. 📷 "Axios on HBO" debuts tonight at 6:30 pm ET/PT. Cameos by President Trump, Don Jr., Kimberly Guilfoyle, Gary Cohn, Kevin McCarthy, Steny Hoyer and more. So that we can serve you better, Axios is asking that you take a brief reader survey. Sincere thanks in advance for participating. Here's the link. 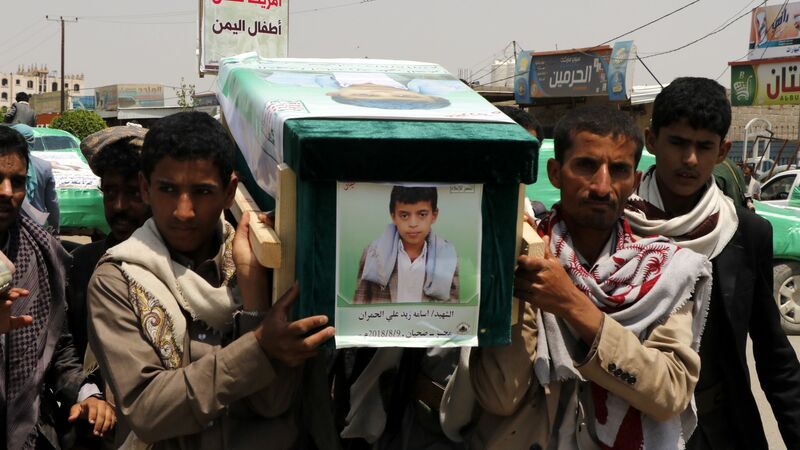 In August, Saudi-led coalition forces used an American bomb to blow up a school bus in Yemen, reportedly killing at least 51 people, including 40 children. In his first public comments on that attack, President Trump told Axios on HBO that the killings were "a horror show." But he declined to say if it's made him reassess American arms sales to the Saudis. I asked Trump whether it bothered him that the Saudi-led coalition has been using U.S. bombs to kill civilians. My colleague Jim VandeHei then asked Trump if this gave him pause about selling American weapons to the Saudis. I pressed Trump during our interview to square one of the biggest contradictions of the midterms: His insistence that Republicans will protect people with pre-existing conditions while his Justice Department argues in court that those protections should be thrown out. The intrigue: As I tried to hand Trump a copy of DOJ’s legal brief, he told me Attorney General Jeff Sessions hadn’t given him a heads-up before adopting this politically explosive position. But that contradicts Sessions’ explanation. The big picture: The Justice Department is arguing that the courts should strike down the Affordable Care Act’s individual mandate and toss out its protections for people with pre-existing conditions in the process. If that position ultimately prevails, millions of people could lose their coverage or see their costs skyrocket. “I support terminating Obamacare, but if we terminate it, we will reinstitute pre-existing conditions in whatever we do,” he said. But as Axios' Sam Baker points out, in the eight years since the ACA passed, Republicans have never proposed an alternative that would offer the same level of protection. Their proposals have either been underfunded or have left gaps that would still expose some people to higher costs and denied coverage. I asked Trump whether Sessions had told him that this was coming. "No, he didn't, actually," Trump said. But Sessions has said he took this politically explosive position "with the approval of the President of the United States." When I asked Justice Department spokeswoman Sarah Isgur Flores about this contradiction, she emailed: "I'll refer you to the WH." White House Press Secretary Sarah Sanders offered this explanation of the situation: "Litigation decisions are typically handled through the White House Counsel's office on behalf of the president. The issue presented in this case is a technical constitutional issue and does not represent the administration's general position on pre-existing conditions." The bottom line: It's not just a constitutional technicality. If the administration wins in court, Americans with pre-existing conditions could be priced out of health insurance. Tomorrow, President Trump will end his pre-midterm blitz of 11 rallies across eight states in six days. Top elections analysts say they doubt they'll move the needle for Republicans. What they're saying: Cook Political Report's Dave Wasserman pointed to Pennsylvania's 18th district, which Trump won by 20 points in 2016. Even though Trump visited the district twice before the special election earlier this year, Democrat Conor Lamb still flipped it. "I'm not convinced their [Trump and VP Mike Pence] visits make much of a difference," Wasserman told Alexi McCammond. Kyle Kondik of Larry Sabato's Crystal Ball at the University of Virginia shared that skepticism. "I'm not sure what happens in the final days of the campaign should cause someone to dramatically change their previous thinking too much," he said. "It’s kind of the silly season in politics." By the numbers: Last-minute midterms forecasts unanimously predict Democrats winning the House and Republicans keeping the Senate. Strategists from both parties have predicted Dems will win around 35 House seats (they need 23 to take control of the House.) That'd be better for Trump than the 37 seats lost on average for a president with an approval below 50% during his first midterm election. The latest generic ballot numbers aren't "indicative of much change one way or the other," Kondik says. Consider this: On Sept. 4, Democrats led by 8.9 points; on Oct. 4 they led by 7.7; and today they're leading by 8.1. The Senate is still an uphill battle for Dems, and some key races are tightening. The best example is Sen. Claire McCaskill in Missouri, one of the most vulnerable Democrats, who's now tied with challenger Josh Hawley in a new poll out yesterday. And in Indiana, Sen. Joe Donnelly (who's been the target of Trump's tweets lately) is in a dead heat with Mike Braun, per a new NBC poll. A Fox News poll from the end of October showed Donnelly up by 7. Go deeper: Read this rich on-the-ground reporting from The Guardian's Ben Jacobs. Jacobs emails: "I spent four days last week in Illinois reporting on two traditionally Republican suburban House districts that are toss ups this year. In one, the aversion to Trump is so much that the incumbent Republican is trying to paint his Democratic opponent as the Trumpian candidate." The House and Senate are on recess. Monday: Trump will do rallies in three states — Ohio, Indiana and Missouri — ahead of Tuesday's midterm elections. Friday: Trump is scheduled to travel to Paris to commemorate the 100th anniversary of the end of World War I. White House national security adviser John Bolton has said Trump expects to meet in Paris with Russian President Vladimir Putin. It would be their first meeting since Helsinki — the meeting for which Trump was heavily criticized for appearing to favor Putin's denial of election interference over the unanimous findings of the U.S. intelligence community. For the Axios HBO series, we interviewed people who've negotiated with Donald Trump throughout his life in business and in politics. One very Trumpian story came from Peter Osnos, the editor of Trump's 1987 book "The Art of the Deal." "When the idea of meeting with Trump came up ... I thought to myself how do we impress Donald Trump? So I went to my shelf and took "Generations of Winter" by the wonderful Russian writer Vasily Aksyonov. Nice big fat Russian novel. There was no lawyer. There was no agent. Extraordinarily and very quickly he wanted to do it. Why not? I would say having now been in publishing for a very long time, it's one of the simplest deals that I ever had. And that's how we brought Donald Trump and the Russians together in 1986."